~ The Frugal D.I.Y. Mom ~: Sugar Free, Low Carb, Gluten Free Peanut Butter Cookies! 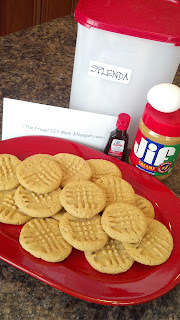 Peanut butter cookies are one of my favorite indulgences and this recipe is one I can feel better about when I eat the whole batch...oops, I mean when I eat a few of them! My friend, Mikki, reminded me of this recipe last year...I had forgotten that we used to have them as kids all of the time until I found the recipe in my recipe collection! (OK, that shows you how often I actually cook from my recipe collection...the internet is so much faster!) Nevertheless, these are FANTASTIC and, I think, just as good as the "real" version! These will appear a little sticky after mixing, but will roll into a nice little ball for you. I get about 16 cookies out of one batch. Take your fork and just press it down slightly to make the cute little design on top! Bake for about 10-12 minutes at 350. I took mine out at 10 minutes because I am ALWAYS burning things. I let them sit on a cookie sheet to cool because they will continue to bake a bit that way. I wouldn't wait to watch them turn golden brown, they don't change color much and they aren't "stiff" to touch when they are ready to come out of the oven. They continue to harden a bit. This is also a great recipe for kids! Me and my 17 year-old 6 year-old helped me with this one! Shoot me an email at jesusandcouponsdotcom @ gmail .com! I'm trying to figure out the nutrition info. How many cookies does this make? I just tried this recipe and my cookies literally disintegrate everytime I touch them, into fine crumbs. What did I do wrong? Add some cream of tarter it will help the not crumble so bad. You will need to let them completely cool. Be sure to spray your pan with some Pam before baking. Mine fell apart to, even trying to move them from the pan to the cooling rack. How can they be sugar free if they have peanut butter in them? Peanut butter has sugar in it. You can get natural peanut butter with no sugar added. I took your idea of 1/3 cup stevia and 1/2 cup coconut flour and I added 1/4 cup melted butter. Helped keep them together. I baked about 8 minutes. Turned out pretty good. Eggs have 2 carbs, no carb in Stevie and all natural peanut butter has 32 net carb. Nothing in vanilla extract. So the net amount of carbs is depending on how many cookies you make. Just wanted to say I love these. I've had this article saved on pinterest for over a year now and make then regularly. I've never had a problem and they're are delicious! I've made these for years, using sugar and never had a problem with them falling apart. I'm curious if it's the Stevia. I'm going to try with Stevia and see how they come out. It's been over 20 years since I've made this recipe. They were always good and super simple to make. It is always difficult to do the baking of the gluten free backed goods as it is so different from the normal cooking. Similarly it is also difficult to get use to the taste which is also so much different than the usual baked items.